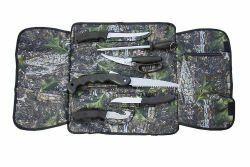 The 6-piece hunting kit includes an 11 1/2" steel sharpening rod, a 9 1/2" folding bone or tree saw, a pair of 9 1/2" game shears, an 8 1/2" gut-hook skinning knife, an 11 3/8” fillet knife, a 9 1/2" drop point knife, and latex rubber gloves. Each tool in our hunter's kit comes with a 420 stainless steel blade and has molded non-slip black rubber handles. All pieces fit in a zipper-pocket camo nylon roll-up case with Velcro straps.